Note: Discounted units with cosmetic imperfections. 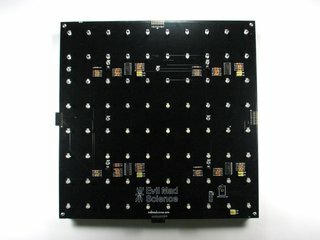 These "B-Grade" Digi-Comp II units are identical to our Digi-Comp II, First Edition kits, except that the price is discounted because they have cosmetic imperfections. They are built and tested alongside our other Digi-Comp II kits, and must pass the exact same set of tests before we ship them. The only difference is that they have one or more cosmetic defects that are guaranteed to not affect operation. Most B-Grade Digi-Comp II units have one or more small knots, gaps, chips, regions of natural wood discoloration, or mismatched grain boundaries in the channel bottoms, so long as those issues are strictly cosmetic and do not affect operation. 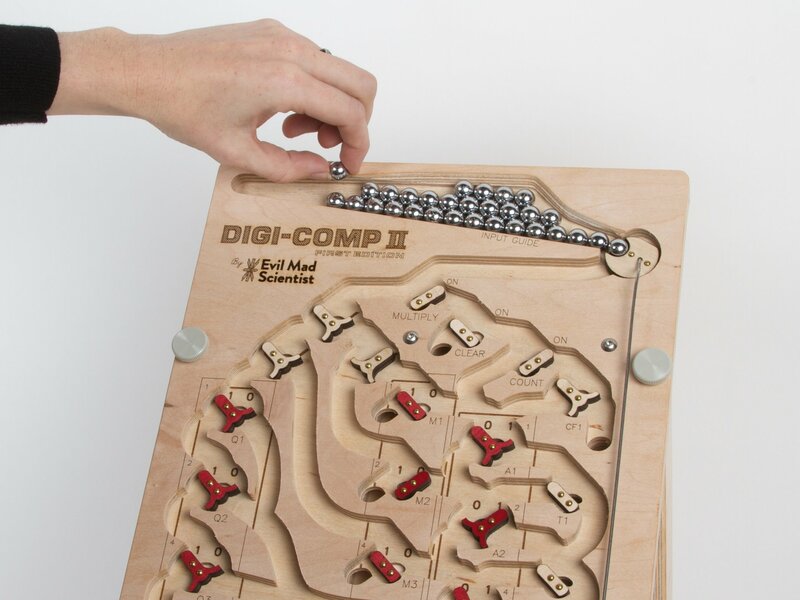 A little background: The upper "playfield" of the Digi-Comp II, First Edition kit is made from half-inch all-hardwood veneer-core plywood. We use a CNC router to carve the channels where the balls can roll, and cut the channels with enough precision that we split an individual layer of the plywood, to give a clean appearance to the bottoms of the channels. Unfortunately, if an individual sheet of plywood happens to have any kind of defect on this deeply-hidden inner layer-- a knot, a darker part of the wood, a softer part of the wood, a more brittle part of the wood, a gap in the layer, or a mismatched boundary between inner ply sheets --we can end up with a corresponding defect in the final product. These B-Grade Digi-Comp II kits are built up from those playfields that do have one or more of these issues, and don't quite pass muster to ship as our regular "A grade" kits. 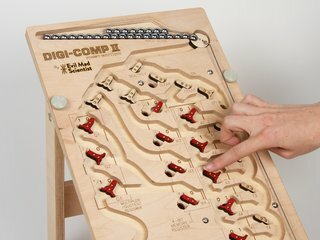 The Digi-Comp II: First Edition is a modern, fully-operational recreation of the Digi-Comp II, the classic 1960's educational computer kit. The Digi-Comp II was invented by John T. Godfrey, and is described in US Patent No. 3,390,471, which was filed on April 30 1965. 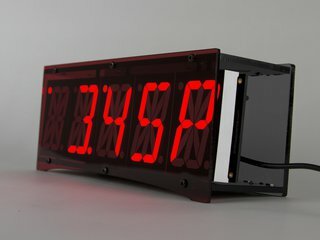 It's an automatic binary digital mechanical computer, capable of conducting basic operations like adding, multiplying, subtracting, dividing, counting, and so forth. 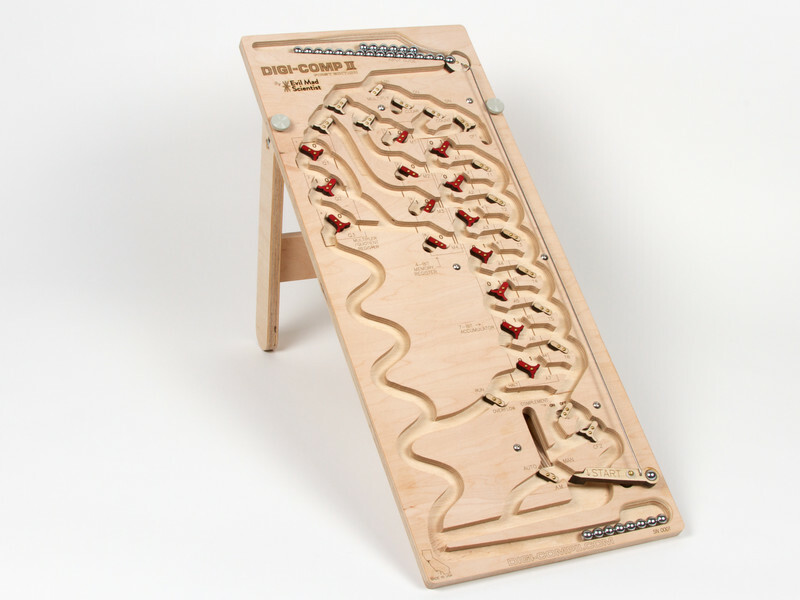 And what's more, all of these operations are conducted by the action of balls rolling down a slope, directed by mechanical switches and flip flops, and all powered by gravity. Overall, it is slightly smaller than the original (mid 1960's) Digi-Comp II, which used half-inch diameter glass marbles. Rather than marbles, we've opted for pachinko balls, which are shiny steel balls 11 mm (about 7/16") in diameter. Using the smaller size has allowed us to reduce some of the feature sizes, and reduce the overall size of the machine from 14×28.5" to 10×24", while retaining all of the original functions and remaining finger-friendly. 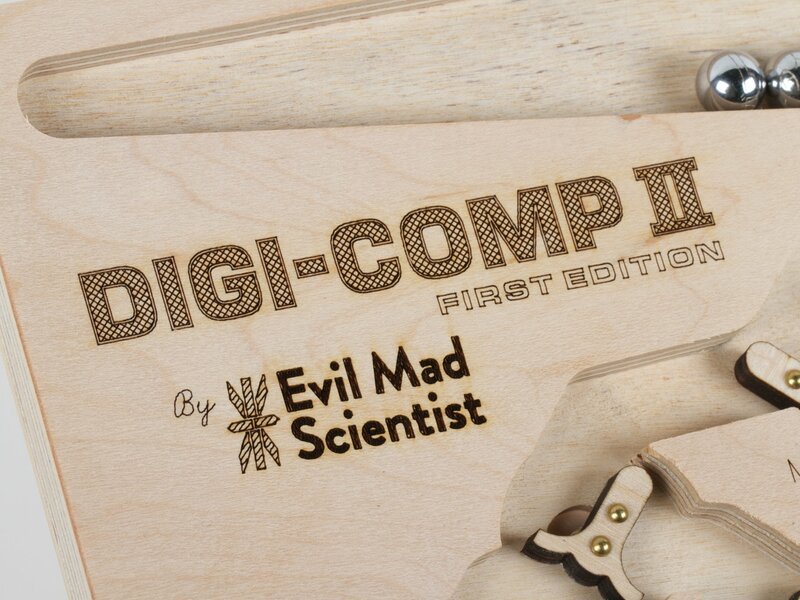 The Digi-Comp II: First Edition is CNC carved from rock-solid half-inch hardwood plywood, laser-engraved to provide it with labels, and hand fitted with over 60 laser-cut parts. It comes assembled, tested, and ready to use. The fully assembled and tested Digi-Comp II, with its matching stand, a bag of 35 pachinko balls, a quick start guide, and carrying case. We have scanned and posted online the full Digi-Comp II manual, and you will probably want to download it to supplement your quickstart guide: Download Link (4.7 MB PDF file). Does it takes a lot of balls to run a Digi-Comp II? Is this really a "kit?" Yes, but not one that really requires assembly. If we've used the word kit here, it's because we're a "kit business," in the habit of selling kits. 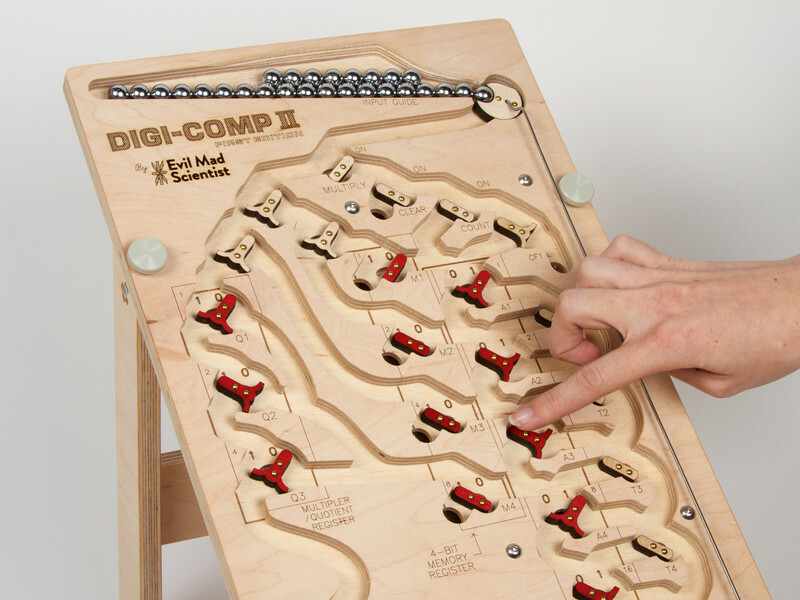 ;) The Digi-Comp II: First Edition actually comes assembled and tested, ready to use. Open up the box, screw on the stand (using the two stupidly-large thumbscrews), and pour in the balls. This is actually a lot less work than it was to put together the original version from the 1960's! We started out using half inch (12.7 mm) steel ball bearings, but ran into issues with high costs and corrosion. The 11 mm (~7/16") pachinko balls are mass produced and inexpensive, and are quite corrosion resistant. Reducing the ball size also allowed us to reduce the overall size of the machine, without sacrificing features. Is this really a "computer," if it only does mathematical operations? In the 1960's, the Digi-Comp II was called a computer. But today, we might more commonly refer to a device with these functions (adding, multiplying, subtracting, dividing, counting, complements, etc.) as a calculator or arithmetic and logic unit (ALU). However, the Digi-Comp II manual shows you how to map operations onto (e.g.) Fortran, assuming that you allow a human to do some of the setup operations on the Digi-Comp. So, while it's not turing-complete on its own, it is actually still a fair description. In what sense is it "automatic?" Most calculations are semi-automatic. 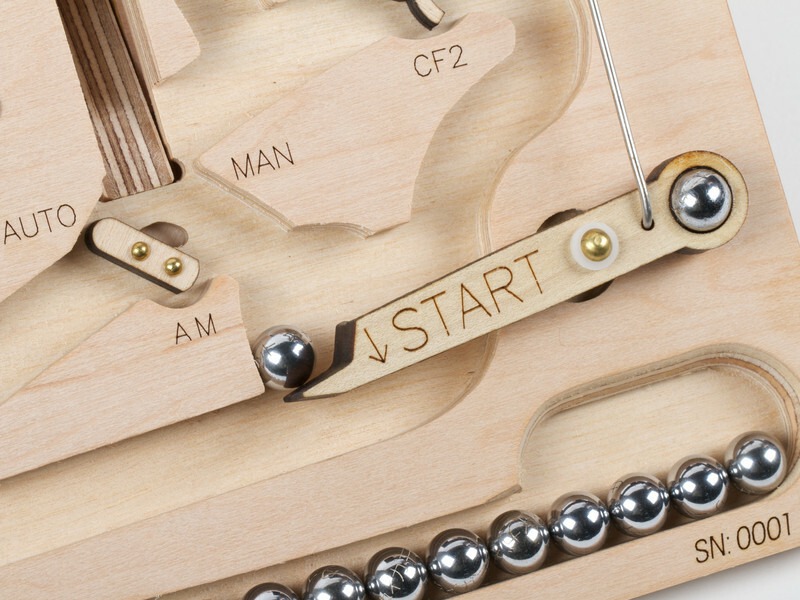 For example, once you enter two numbers that you wish to multiply together (and set the appropriate configuration switches), you pull the start lever to release the first marble. 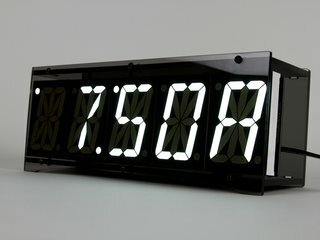 Running the full calculation can take quite a few marbles. 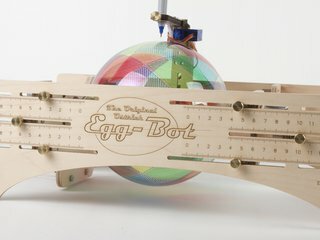 But, once the first ball makes its way through to the bottom, it releases the next ball from the top, and so on, until the calculation is complete? at which point it stops. 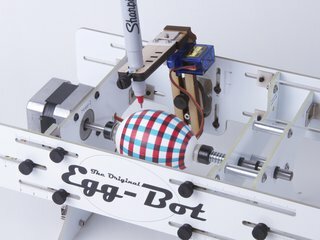 You can see a video demonstration of the Digi-Comp II Ball Release Mechanism here. We begin with half-inch all-hardwood veneer-core plywood, and use a CNC router to carve the channels where the balls can roll. The depth of the channels is cut with enough precision that we split an individual layer of the plywood, to give a clean appearance to the bottoms of the channels. After routing, the wood is sanded, and then laser-engraved to give the labels and markings for the playfield. The wood surface is left unfinished except for this lasering and sanding. 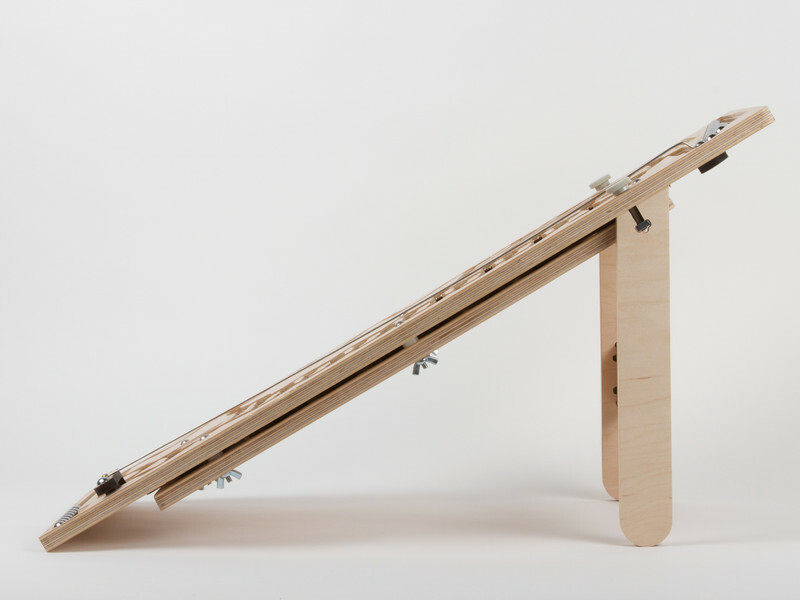 The lower deck of the Digi-Comp II and the stand are also cut out on the CNC router. 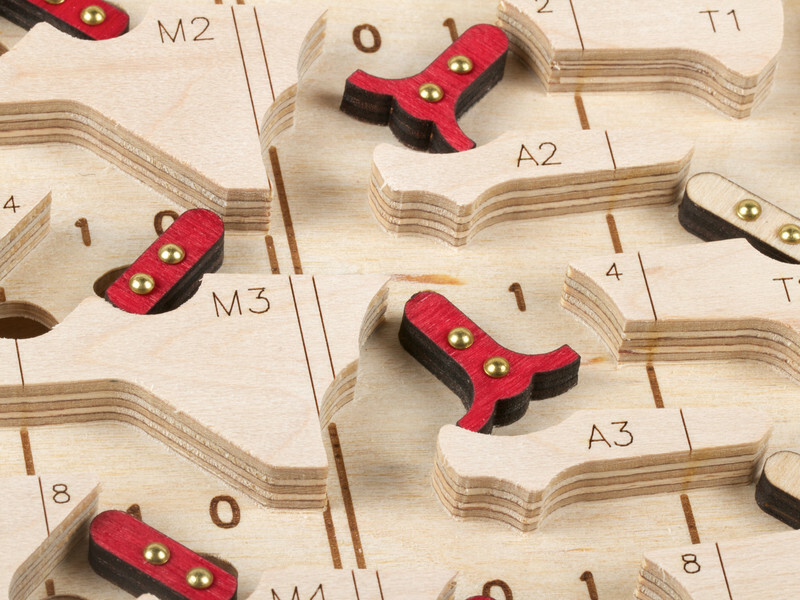 The individual flip flops and switches are laser cut from 1/4" hardwood plywood. The start lever is made of several parts laser cut from 1/4" poplar and glued together. The flip flops and switches are installed with brass pins for their pivots. 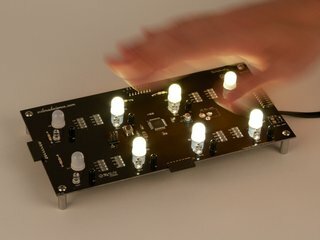 Finally, the whole assembly is tested to make sure that it works correctly. 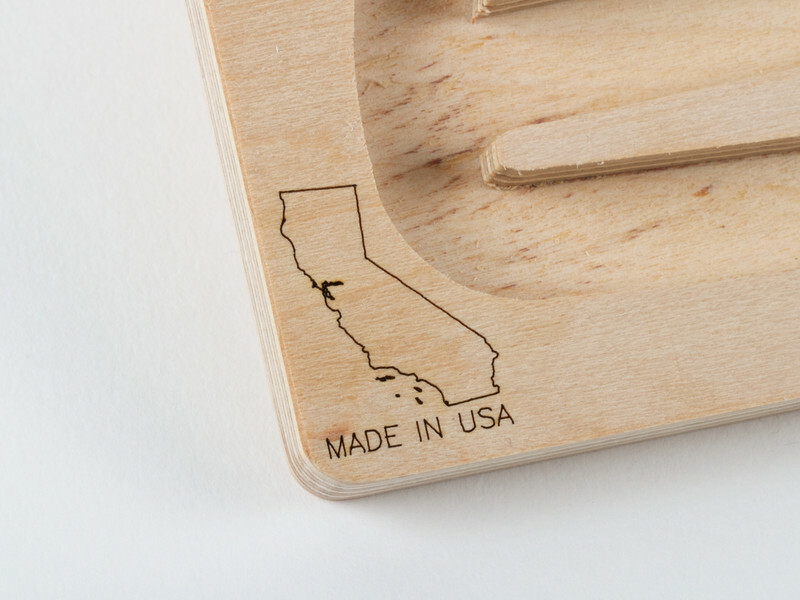 Overall, we think of the production process as "handmade with the assistance of robotic tools." We've also written a photo-heavy blog post about the making of the Digi-Comp II; if you'd like to see some of the process, please take a look. Will my Digi-Comp II look exactly like the one pictured? It will look very close to the one pictured. Natural materials are used, which do have variation from unit to unit. Some units have minor knots or cosmetic defects on the channel bottoms, so long as they do not affect operation. No, and because there are small parts-- like those steel balls --you actually need to actively keep it away from small children. The top deck is 24×10" in area. When propped up on its stand, it's approximately 12 1/2" tall. Does this thing really weigh 16 pounds? Nope. The Digi-Comp II: First Edition weighs about 8 Lbs as it ships. However it is large enough that its "dimensional weight," 16 lbs, is the correct figure to use for calculating shipping rates. We've been working on this for a couple of years, and we have some other versions that you might want to look at. Click here to see a video of our larger than life version, as seen at the 2011 Bay Area Maker Faire.